Extremely spicy. The hottest chile peppers in Thailand are dried and roasted, pounded into a paste and mixed with garlic, shallot and oil. That's all there is to this paste, and it really packs a punch. Dab it over steamed jasmine rice for a quick snack, put it in any soup, especially Tom Yum for which this was made. Notice in our Tom Yum Street Vendor Video she is adding this mixture to the soup, making the chile flavor strong and deep. It doesn't take much, as you will discover. This paste is the hottest we have ever offered, and caution you to use it sparingly. Comes in a generous 14 oz plastic jar with double sealed lid. Lasts a long time. 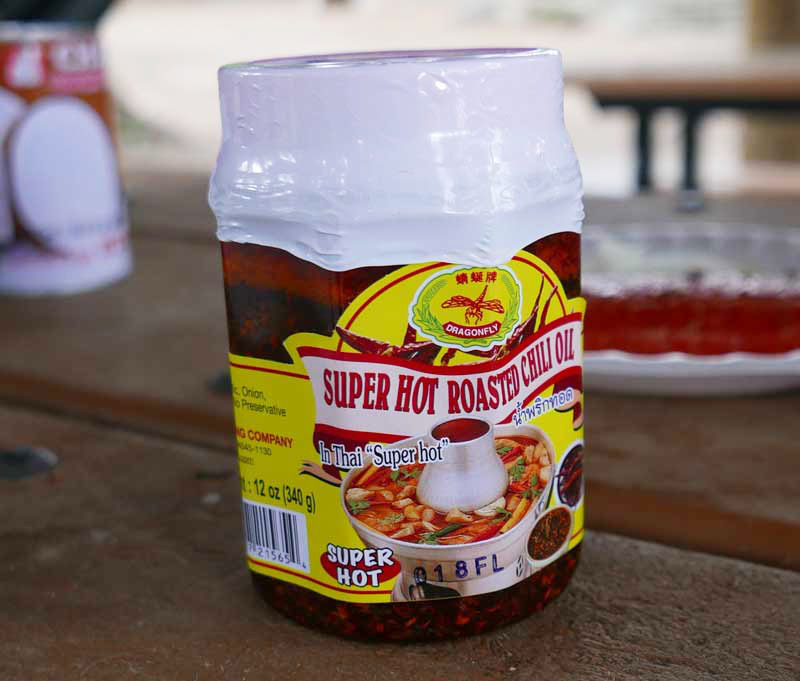 This is extremely high in spice heat which is a natural preservative in it's own right. Ingredients: chile, garlic, red onion, vegetable oil. All natural. Product of Thailand.